ARISTO cutters, precise and powerful, have for decades been a success in many industrials fields in the processing of different materials. 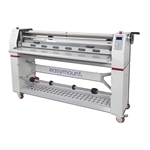 Distinctive characteristics are: - precision, high throughput, reliability, economic price/performance ratio, handles refective vinyls, traffic and advertising signs, foam plastics, laminates, technical fabrics, paperboard, wood, hardboards, non-ferrous metals or others, the cutters of the ARISTOMAT P³ Series offers the optimal solution for your cutting graphic applications & prototypes. The ARISTOMAT P³ Series was created to focus on providing a simple solution for, packaging, prototypes, POP display creation, gaskets and other such precision products cut from flat stock, custom print-to-cut processing, and much, much more. All ARISTOMAT P³ Series cutters are equipped as standard with precision Mulithead & Automatic Eye detection system for exact positioning and measuring of the material. This is a demo unit with very low usage. It is crated and ready to ship. * Shipping is dock to dock/forklift and does not include riggers or special handling at destination. • Located near Atlanta, GA, this unit is crated and ready for shipment. 51"W x 67"L working area. Aristo Cutter Control Panel Software included for driving the machine. Complete with a MultiHead tool attachment, will easily handle many varieties of materials. HP Scitex FB700 98" UV Flatbed Printer w/ Roll Feed Fotoba Rollcut WR61 X / Y Cutter 2010 OCE GT-350 98" Flatbed Printer with Roll-Feed HP DesignJet L365 64" Latex Printer, Virtually BRAND NEW!! HP DesignJet L310 54" Latex Printer Mimaki JV33-160 64" Wide Format Printer Island Clean Air Duster 3000 - Fume Control Easymount SH 63" PSA Laminator w/Air Nip Pressure & Heat Assist, NEW! !